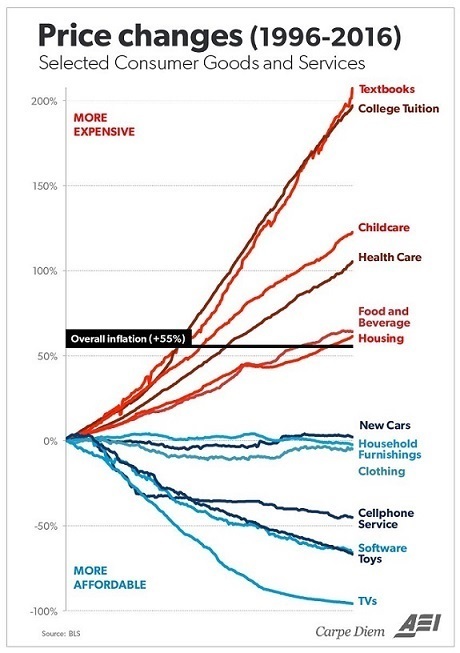 If you want to understand why we’re fragmenting as a society, start by looking at the asymmetric burdens imposed by inflation. In our household, we measure real-world inflation with the Burrito Index: How much has the cost of a regular burrito at our favorite taco truck gone up? The cost of a regular burrito from our local taco truck has gone up from $2.50 in 2001 to $5 in 2010 to $6.50 in 2016. That’s a $160% increase since 2001: 15 years in which the official inflation rate reports that what $1 bought in 2001 can supposedly be bought with $1.35 today. My Burrito Index is a rough-and-ready index of real-world inflation. To insure its measure isn’t an outlying aberration, we also need to track the real-world costs of big-ticket items such as college tuition and healthcare insurance. When we do, we observe results of similar magnitude. Our money is losing its purchasing power much faster than the government would like us to believe. If you think I cherry-picked these two public universities, check out this article. 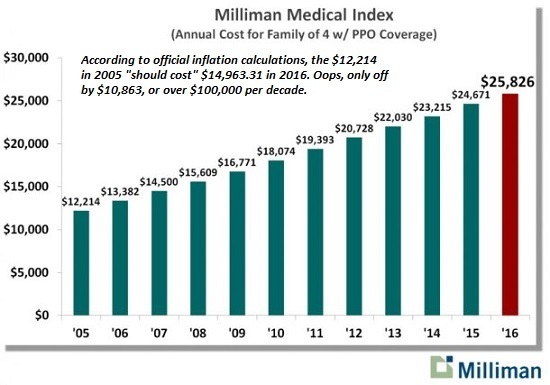 According to official inflation calculations, the $12,214 annual medical costs for a family of four in 2005 “should cost” around $15,000 today. Oops—the actual cost is $25,826, $10,826 higher than official inflation, which adds over $100,000 in cash outlays above and beyond official inflation in the course of a decade. No wonder the political and financial Elites don’t care about inflation: their incomes have soared far above mere inflation. When you’re skimming millions, who cares about a mere $150,000 for a university education, or $25,000 for healthcare insurance? Do you reckon the lobbyists for Big Pharma and the rest of the healthcare racket are spending millions lobbying politicians to slash the soaring costs of healthcare? Do you think all the universities collecting billions in government-guaranteed student loans are lobbying politicos to reduce loans to debt-serf students? Sorry, but that’s not how pay-to-play “democracy” works. In pay-to-play “democracy,” the goal is to raise prices without improving service, and have the federal government enforce this racket on powerless debt-serfs. If you want to understand why we’re fragmenting as a society, start by looking at the asymmetric burdens imposed by inflation. The Elites aren’t worried about inflation because they don’t even feel it. And since they rule to benefit the top 5%, they don’t really care what the bottom 95% are experiencing.